The new Bond fragrance, High Line will launch in March 2010. It is named after the High Line, an elevated public park system in NYC. It is a renovated green space on a 1.45-mile-long elevated rail structure running from Gansevoort Street to 34th Street on Manhattan's West Side. There are 210 plants species featured in the park. 161 plants are native to New York. 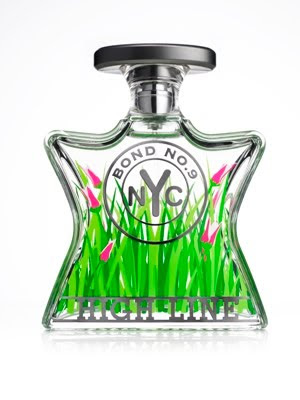 Bond was inspired by these plants to create a NYC themed fragrance that evokes "the Hudson river, urban wildflowers and a hint of industrial grit". This scent mixes bergamot with a note called prairie grazing weed or purple love grass. The fragrance also boasts an Indian rhubarb note, that will delight many of my fragrance friends. There are serious rhubarb fans out there. The heart of the fragrance is a red-leaf rose, lady jane tulips and grape hyacinth. I have a great weakness for the hyacinth plant. No fragrance has really captured the heady flower. The drydown of High Line is Bur Oak(a High Line park tree),sea moss, musk and teakwood. The sea moss gives me pause, because aquatic notes and me do not get along. It will retail for $145(50ml)and $220(100ml)at your local Bond counter at Saks Fifth Avenue or one of the four Bond boutiques. Visit http://www.bondno9.com/ for more details. Also visit http://www.highline.org/ for more information concerning the park. I have not visited the park yet, but have it on good authority(my beloved friend Shawn) that it is lovely. I am all about Hyacinth too. I am looking forward to trying this, but aquatic notes give me pause as well. Have you ever tried Jacinthe des Bois by L'Artisan ? Sadly DC'd now , it is the most gorgeous hyacinth. I was so happy to grab a bottle a couple years ago when new stock came in. This is one they sorely need to bring back. The High Line is indeed lovely, and I'm happy to see it get it's own perfume. "Grape hyacinth" is a very different flower from the heady, perfumey hyacinths one normally thinks of. It is a tiny purple wildflower that looks like (doh) a bunch of grapes grows in the grass. It has a fresh, sweet, purple fragrance, somewhere between violet leaf and wild grapes. I think of it in the same category, smell-wise, as lightly fragrant tulips (there are a few!) and daffodils. It smells like spring. Not that the official notes have anything to do with reality when it comes to perfume...LOL...but I don't think this will be your hyacinth HG. I'd look to Andy Tauer for that. your link doesn't go to the appropriate site... I looked it up, and the correct one is www.thehighline.org. Just thought you'd like to know! Gah, I need to try this! It sounds a bit flowery for my tastes but Bond rarely disappoints. What a beautiful bottle! I cannot wait to try it! Sounds interesting, but note that the "grape" hyacinth is only distantly related to the fragrant kind, and is barely scented itself. Not sure why it would be used as a perfume note. "Red-leaf rose" - would that be the species Rosa rubrifolia, with tiny single flowers that are NOT grown in commercial quantities? Sounds like more hot air from this line-not that misleading ad copy is unique to Bond No. 9 of course! Being a big fan of fragrances I always like to smell and try out new ones and I wanna try new fragrances it is sounds interesting!